We left early on a cold, frosty Sunday morning for Glenlude, which is a big wild area near the Southern Uplands in the Scottish Borders. 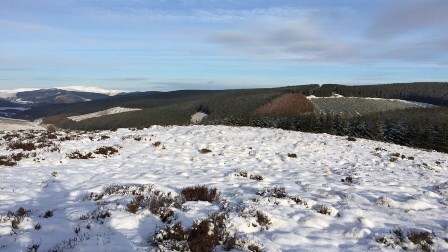 It is owned by the John Muir Trust and the main work there is to replace part of the conifer plantation at Glenlude with native broadleaf trees. The plan is also to plant native woodland on some of the open grassland. When we arrived we first did some work which included rebuilding and replacing tree guards. 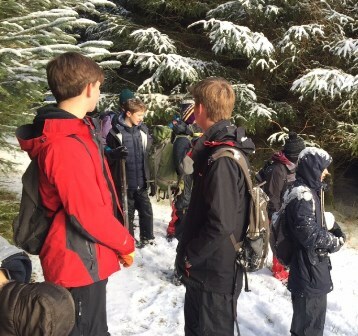 We also played some games including building a snowman, in which our team won, we also went to the top of a hill to get a clear view of the area covered by snow. We then had our lunch that we brought and had a chance to relax and talk to each other. I was glad that I had brought some hot soup that day as it was very cold and snowy all around. After lunch we did some more work at Glenlude and took some photographs. On the way home, I was presented with the John Muir Award and was given a certificate for my work volunteering with the Green Team. I was very proud to get this and will put it up on my wall in my room.